Last recipe in this loaf series! I grew up eating lots of banana bread. Both of my grandmothers used to bake it often. Either in loaf form or muffin form. This was my fave. No matter the shape. And although I am not the biggest fan of bananas... 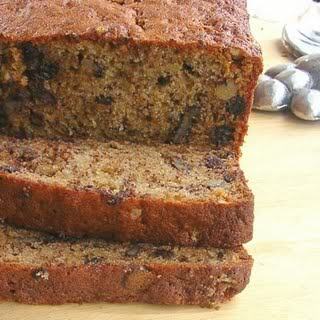 I still love a good banana bread! But it can't be too sticky sweet or too moist. It must be light and spongy and a little more on the dry side! And I love the crunch that nuts bring to the mix! Grease or line with parchment paper a standard loaf pan or an 8x8” glass pyrex dish. Pour into the greased loaf pan and bake for about 50 minutes if using a standard loaf pan or for 25-30 minutes if using an 8x8” glass pyrex dish. Oh! And if you're feeling a little crazy, whip up a little maple glaze to pour over the warm banana bread! Make it using a little powdered sugar and maple syrup. Maybe even a little vanilla. Adjust the ratios according to how thin or thick you want your glaze to be!